Objective: Apply food preparation guidelines related to pies and soups. Practice presentation and safe food handling procedures. This is the best selling recipe for my culinary program’s take home meals that faculty and staff can purchase to take home and bake for dinner. Our pot pies are assembled and frozen but not baked! Chicken Pot Pie Profit Sheet (Excel) – change this document to match your pricing and ingredient costs. It is not uncommon for my culinary students to make at least 30 of these pies. I created an ingredient matrix to help with ordering ingredients for each year’s demand. Chicken pot pie ingredient matrix (Excel). Recipe modifications: I don’t use dry sherry in my recipe or fresh thyme leaves. I always use whole milk. The secret to this recipe is the butter crust. I realize this poses a challenge as butter crust must be refrigerated and is a pain to roll out sometimes. If the crust is too frustrating only roll tops for the pies and leave off the bottom crust. Making so many pie crusts by hand is silly so use a food processor. Don’t over mix or it will turn into butter/flour paste – it should still look like crumbles that you have to squeeze together to form a ball. If you make 30 plus pies that is an awful lot of vegetable chopping! You can use a food processor to save time or if you like to see them squirm give them the 10lb bag of onions to dice …. I use about 2 cups of cubed chicken meat in each filling recipe. Sometimes I have the students take all the meat off the bones from the stock and other times I boil chicken breast in the stock to make the dicing go faster. The pies are much easier to fill when the filling is cold. I suggest making the filling one day and assembling pies the next. Otherwise what happens is that the filling starts melting the crust and it is very difficult to prevent them from spilling as students are putting them in the freezer. One pot pie filling recipe is enough to fill 2 shallow 9″ pie tins. You will need two crust recipes though. 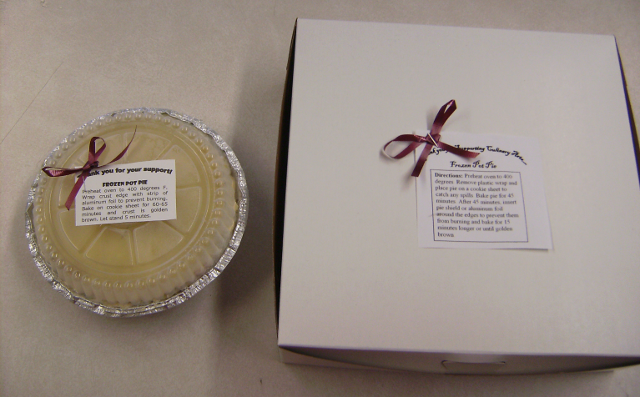 Pies are much easier to transport home when they are frozen and in a pie box. Freeze them for at least a half day before sending them home with customers. You don’t want customers with pot pie puddles in the back of their cars! 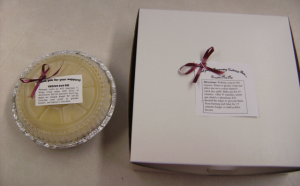 Group 4, 5: Make pie crusts- refrigerate by pressing dough into disks and wrapping with plastic wrap.